From demographics and schools to transportation and restaurants, go to my business Facebook link Community Information Report to find out all about an area you are researching. The term Tampa Bay refers to the tri cities of Tampa, Clearwater and Saint Petersburg and all the little communities in between. Tampa is my home. Driving around the Tampa bay area, you’ll find homes of every size, shape and color. Some practical while others, not so much. From celebrity homes with boat, airplane and golf cart garages and helicopter pads, to trailer parks. You’ll find only a few homes remaining that were built in the late 1800’s just south of downtown Tampa. But with the introduction of many types of industries to Tampa in the early 1900’s, you’ll still find many of the original homes from that boom era still standing. From the 1920’s you’ll find, majestic original homes in Old Hyde Park, lining Bayshore Boulevard and in Old Northeast Saint Petersburg. Art deco homes from the 1930’s off Beach Drive in downtown Saint Petersburg. Magnificent homes, condo’s and cottages from every era and time that line the Pinellas County beaches. You’ll find California contemporary homes from the 1960’s and the 1970’s in Original Carrollwood and Carrollwood Village. Magnificent Tuscan style era homes on Lake Keystone, Lake Magdalene and Lake Carroll and many Key West style homes line old Tampa Bay. Modern homes that mimic every era are found in Westchase and New Tampa. The Tampa bay area is a haven of design and personality from antiquity to modern day. There is some dispute as to the origin and meaning of the name Tampa. It is believed to mean, sticks of fire, in the language of the Calusa, a native American tribe that once lived south of the area. This may relate to the high concentration of lightning strikes that west central Florida receives every year during the summer months. Tampa is known as the Lightning capital of the world and why we call our hockey team, The Lightning. Other historians claim the name refers to the place to gather sticks. Toponymist George R. Stewart writes that the name was the result of a miscommunication between the Spanish and the Indians, the Indian word being itimpi, meaning simply, near it. The Tampa Bay area is rich in history. The name first appears in the memoir of Hernando de Escalante Fontaneda from 1575, who had spent 17 years as a Calusa captive. He called it Tanpa and describes it as an important Calusa town. While Tanpa may be the basis for the modern name, Tampa, archaeologist Jerald Milanich places the Calusa village of Tanpa at the mouth of the Charlotte Harbor near current day Pineland. Map maker Bernard Romans found certain difficulties in translating earlier Spanish-era maps of Florida to English and may have accidentally transferred the name north to Tampa Bay, which is the next large inlet up the west coast of Florida from Charlotte Harbor. The Tampa Bay area was a major Indian reservation for the Tocobaga Indians prior to the invasion of the Spanish in 1528. The Tocobaga Indians lived in small villages at the northern end of Tampa Bay from 900 to the 1500’s. Each village was situated around a public area that was used as a meeting place. The houses were generally round and built with wooden poles holding up a roof of palm thatches. The Tocobaga Indians built mounds within their villages. A mound is a large pile of earth, shells, or stones. The chief’s home and the tribe’s temple were each built on a mound. The Tocobaga also built burial mounds outside the main village area as a place for burying the dead. The women of the Tocobaga tribes had a garbage heap called a midden, which was located next to their kitchen. Middens were created by the Tocoboga’s use of shellfish for food. The midden consisted of a mound of shells that had grown and packed together throughout the years as shells were discarded after every meal. Their are only a few mounds remaining in our area. One of the largest mounds is in Phillipe Park in Safety Harbor. Another is in South Saint Petersburg off 62nd Ave. South. Archaeological digs in the Safety Harbor area of Florida have uncovered many artifacts, or man-made objects from the Tocobaga. Items such as plates and pots have been found indicating that the Tocobaga Indians were expert potters. As a young boy, I used to live very close to the Hillsborough river. It wasn’t uncommon to find arrow heads scattered in the sand along the banks of the river. What Happened to Them? In approximately 1528, Pánfilo de Narváez, a Spanish explorer, arrived in the Tampa Bay area. 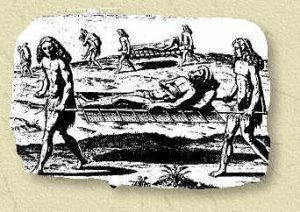 He and his men found the Tocobaga Indians and unfortunately, brought disease and violence to the tribe’s peaceful existence. Sadly, as a result, the Tocobaga Indians became extinct within 100 years. Spanish explorers coming to Florida brought gold for the purpose of economic trade. And when there’s gold, there’s pirates! Jose Gaspar the famous local pirate and his legends of burying booty somewhere along the banks of the Hillsborough river. The stories of Gaspar are fairly consistent. Most say he was born in Spain in the mid 1700’s and served in the Spanish Navy aboard the Floridablanca. Among his early exploits was his kidnapping of a young girl for ransom; some versions give his subsequent capture as the cause for joining the navy. Simpler versions of the story have him starting a mutiny and becoming a pirate soon after, but more romantic ones say he achieved a high rank and became a Councillor to King Charles III. He was popular in the court, but when he chose one lover for another, the dumped lady levied false charges against him, often said to involve the theft of the crown jewels. To escape arrest he commandeered his ship and vowed to exact revenge on his country through piracy. Renaming himself “Gasparilla”, he patrolled the coast of Spanish Florida for the next 38 years, from approximately 1783 to 1821, the dates of the second Spanish rule of Florida, sacking every passing ship and amassing a huge treasure, which was stored in his fabulous den on Gasparilla Island. Most male prisoners would be put to death or recruited as pirates, while women would be taken to a nearby isle, called Captiva Island for this reason, where they would serve as concubines or await ransom payment from their families. José Gaspar, locally known by his new self proclaimed name, Gasparilla, was called the “last of the Buccaneers”. The name was adopted by our National Football team, the Tampa Bay Buccaneers. 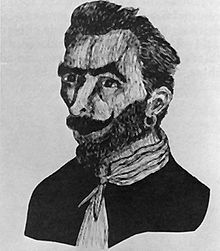 Though José Gaspar is a popular figure in Florida folklore, no evidence of his existence appears in writing before the early 20th century. His legend is celebrated every year in Tampa with the Gasparilla Pirate Festival. The Tampa Bay Gasparilla Pirate invasion includes the ritual of taking the keys to the city, which the mayor gladly forfeits in exchange to have their life spared. A parade and festival follows the invasion which attracts approximately 500,000 to 1,000,000 visitors annually and is the 3rd largest parade in the US. Tampa’s modern history began with the founding of Fort Brooke in today’s downtown area in 1823. The outpost helped bring a small population of civilians to the area. In 1823, the United States imposed upon the leaders of the Seminole Indian tribe, to sign the Treaty of Moultrie Creek, which created a large Indian reservation in the interior of peninsular Florida. The U.S. government then built a series of forts and trading posts throughout the territory to enforce the provisions of the treaty. As part of this effort, Cantonment Brooke was established on January 10, 1824 by Colonels George Mercer Brooke and James Gadsden at the mouth of the Hillsborough River on Tampa Bay, just about where today’s Tampa Convention Center sits in downtown Tampa. The site was marked by a huge hickory tree set atop an ancient Indian mound most likely built by the Tocobaga indians centuries before. Colonel Brooke, the outpost’s first commander, directed his troops to clear the area for the construction of a wooden fort and support buildings, but ordered that several ancient live oak trees inside the encampment be spared to provide shade and cheer. On January 22, 1824, the post was officially named Fort Brooke. A few settlers established homesteads near the palisade, but growth was very slow due to difficult pioneer conditions and the constant fear of attack from the Seminole Indian population, some of whom lived nearby in an uneasy truce. In December 1835, troops led by Major Francis L. Dade were ambushed by on their way from Fort Brooke to Fort King, near present day Ocala, in a confrontation that was named the Dade Massacre. The second Seminole war had begun. During the war, Fort Brooke first served as a refuge for settlers, then as a vital military depot and staging area. After almost seven years of fearce fighting, the war was over and the Seminoles Indians were forced away from the Tampa region, and the tiny village began a period of slow growth. Growth came slowly for the so called, village of Tampa during its modern era for the first half-century, as poor transportation links, conflicts with the Seminole tribe and repeated outbreaks of yellow fever made development difficult. This changed in the 1880’s, when the construction of railroads brought increased trade. The development of industrial commerce brought sudden prosperity and jobs to the Tampa Bay areas. Homes started appearing around the area now occupied by downtown Tampa. Phosphate, a mineral used to make fertilizers and other products, was discovered in the Bone valley region southeast of Tampa in 1883. Soon, the mining and shipping of phosphate became an important area industry. Tampa’s port still ships millions of tons of phosphate annually and this area is known as the “phosphate capital of the world”. In 1891, Henry B. Plant built a lavish 500+ room, quarter-mile long luxury resort hotel called the Tampa Bay Hotel among 150 acres of manicured gardens on the west bank of the Hillsborough River across from today’s downtown. Designed by J.A. Wood, the eclectic Moorish revival structure cost $2.5 million to build, a huge sum for that time. Plant went on an extensive European tour while the resort was being built and sent back exotic art collectibles from around the world to display at his new playground. The structure also boasted the first electric lights in Tampa and the first elevator in Florida! Heavy promotion of the lavish Tampa Bay Hotel in the Northeast US helped attract a steady flow of visitors and business for a few years, and the huge resort was finally filled to capacity during the Spanish-American war. But with Plant’s death in 1899, the hotel’s fortunes began to fade. The city of Tampa purchased the resort in 1905 and used it for community events, including the first state fair. It closed for renovations in 1930 and reopened in 1933 as the University of Tampa. The Florida State fair resided in the same area until the 1970’s when it moved to a much larger area in east Tampa at the intersection of Interstate 4 and US 301. By the end of the 19th century, Tampa had grown into one of the largest cities in Florida, a status it has kept ever since. Tampa, with it’s expansive and protected port, has always been a place for trade dating all the way back to the Indians. For the settlers, Tampa Bay was used as a port to bring goods to the new world. During the industrial age, the introduction of rail to the Tampa Bay area, allowed raw materials and other goods from around the world to easily be transported from the port to all over the young and growing United States. This new railroad link attracted another industry which would finally make Tampa prosper. In 1885, the Tampa Board of Trade helped broker a land deal with Vicente Martinez Ybor to move his cigar manufacturing operations to Tampa from Key West. Mr. Ybor was attracted to Tampa’s warm and humid climate, which kept tobacco fresh and workable, and its new transportation links offered a way of transporting Cigars to the US. Close proximity and Henry Plant’s steamships, made the importation of fine Cuban tobacco easy by sea. And Plant’s railroad made shipment of finished cigars to the rest of the US market easy by land. This relationship is acknowledged in the Seal of Tampa, which depicts Plant’s steamship Mascotte, a vessel that carried thousands of immigrants and tons of tobacco to Tampa. Since Tampa was still a small town at that time, population less than 5,000, Mr. Ybor built hundreds of small houses around his factory to accommodate the immediate influx of thousands of Cuban and Spanish cigar workers. Other cigar manufacturers soon moved in, and the settlement was named Ybor City. Tampa and now Ybor City, became a major cigar production center. Ybor City began as a separate municipality, but seeing the potential for a great increase tax rolls, the city of Tampa annexed the bustling community in 1886. 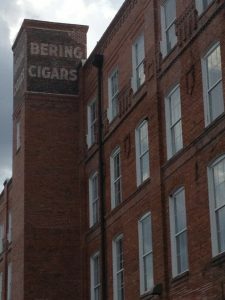 Ybor City and the surrounding vicinity has many of these Cigar factories still standing. Most have been converted to modern offices, but some as you can see here, still bear the original names and some still produce Cigars. Starting in the late 1880s, many Italian and a few eastern European Jewish immigrants also arrived, making Tampa one of the most diverse communities in the Southern US. These new arrivals had difficulty breaking into the cigar businesses, so many opened businesses and shops that catered to the cigar workers. The majority of Italian immigrants came from Allessandria Della Rocca and Santo Stefano Quisquina, two small Sicilian towns with which Tampa still maintains strong ties. The building of Plant’s railroad and hotel, the discovery of phosphate, and the arrival of the cigar industry, all within a decade, were instrumental to Tampa’s development and its very survival. The town suddenly expanded from a dying backwater, mosquito infested village to a bustling small city. Except for temporary bumps along the way, this growth has continued unabated. 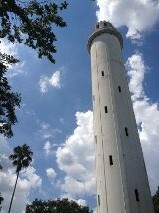 One of Tampa’s landmarks is the Sulphur Springs Water Tower. It’s origin goes way back to the days of Ponce De Leon. Did you know that Ponce De Leon came here looking for the fountain of youth? When he found the artesian springs of Sulphur water, he thought, this must be it! Obviously, there is no such thing, but the legend lives on. Maritime lore maintains that during the time of early European explorers there existed a nautical lighthouse, where the water tower now resides. It guided European ocean frigates from the Bay up through Hillsborough River to replenish their fresh water tanks from the local springs. When the tide came in, ships would come in from Hillsborough Bay up the river to the various springs and artesian wells. The original lighthouse at this location also served as a landmark on pirate and buccaneer treasure maps. There are several pirate-marked trees in the vicinity. In 1927, the lighthouse was removed and the Sulphur Springs tower was built over the opening of an artesian well. The water well and pumps are located under the tower itself. The water tower was built in 1927 by Grover Poole for a realtor and developer Josiah T. Richardson. It was to supply adequate water pressure to the newly built Sulphur Springs Hotel and Apartments and Mave’s Arcade. The hotel, apartments and arcade were constructed next to Sulphur Spring. Richardson had plans to expand the resort to include a spa, a tourist attraction alligator farm and other enterprises. Mave’s Arcade occupied the first floor of the hotel building and was the first shopping mall in Florida! Richardson mortgaged the entire resort for $180,000 to finance the construction of the tower. 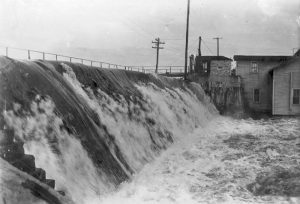 In 1933, the sabotage and collapse of the Tampa Electric Company dam in downtown Tampa, which inconveniently flooded cow pasture land by the dam’s construction, subsequently drained all those fields following the dams destruction. As a result, the arcade was heavily damaged, the businesses in the arcade failed and Richardson lost everything. From 1927 until 1971, the Sulphur Springs water tower operated as a private water company piping artesian well water to commercial and residential customers in the immediate vicinity. The Sulphur Springs hotel and arcade stood in decay for many decades and was eventually torn down. The original artesian spring still remains, but the water has been declared unsafe for human consumption. A new pool was erected next to the original pool to support the local community that used the original Sulphur Springs pool. The Sulphur Springs Water Tower is one of many landmarks here in Tampa Florida. It stands 214 feet tall, with a foundation 45 feet deep which makes it visible from nearby Interstate 275 and much of the rest of Tampa. It’s located in the historic district of Sulphur Springs. Growth continued in the early 20th century and into the 21st Century as Tampa emerged as a modern financial, trade, and commercial hub. We specialize as buyer’s and seller’s agents in South Tampa, SOHO, Hyde Park, Davis Islands, Channelside, Harbor Island, Westshore, Culbreath Isles, Sunset Park, Culbreath Bayou, Beach Park, Bayshore Boulevard and Plant High School district homes. Specialty zip codes 33606, 33602, 33611, 33609, 33629. We are buyer’s and seller’s agents for the rest of the Tampa bay areas including: Westchase, Country Way, Citrus Park, Fawn Ridge, Carrollwood, Carrollwood Village, Old Carrollwood, Keystone, Odessa, Lutz, New Tampa, Seminole Heights, Wesley Chapel, Land O Lakes, Avila, Lake Magdalene, North Dale, North Lakes, Lake Ellen and Forrest Hills. Zip codes: 33613, 33604, 33603, 33614, 33612, 33624, 33618, 33556, 33558, 33559, 33625, 33626, 33635, 33634, 33544, 33543, 33549, 33548, 34639.